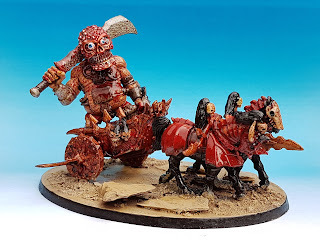 The next installment in my ongoing to quest to make a 2000 pts Age of Sigmar Chaos army is this chariot. 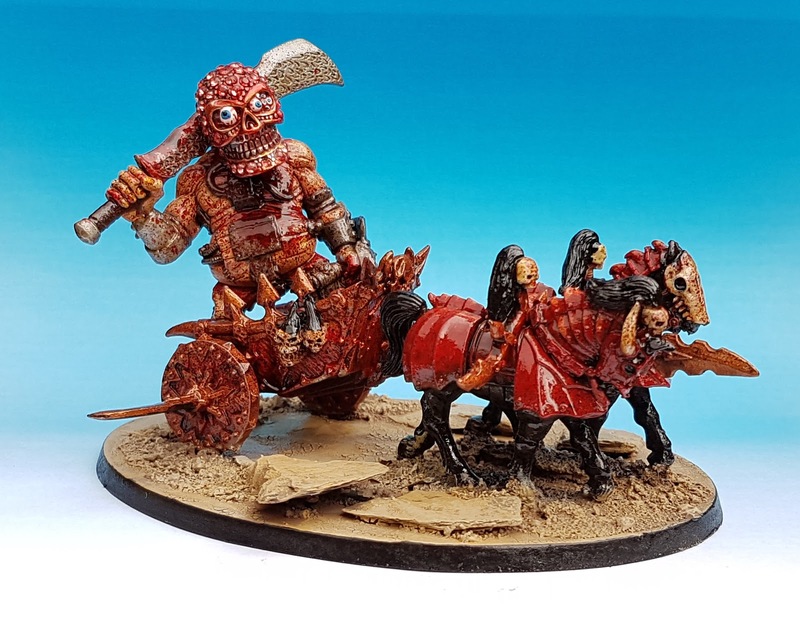 Akmett The Terrible is a merciless killing machine that rides out to battle under loud chants of Manowar or the Aqshyan counterpart. As with all my units in this army the painting is terribly simple. Even you could do it! Yes you! First thing you do is you undercoat the model black... and then you simply block in the colours. Red on the red parts, bronze on the bronze ones... the black is even black already! All the more easy. Then you hightlight a bit here and there - don't be too delicate and make sure to exagerate a bit as we're going to dull the model with a bit of washing later on. I prefer pure white for the final highlights because it looks decent when washed with sepia aftewards. The colours I use are varied and generally I like a triad of VMC red, P3 khador highlight and VMC off white. Skin in this case is VMC medium flesh. Finally the model was given a gory coating of Tamiya clear red and a generous splashing splatter with a toothbrush to create small dots of colour all over the thing. A final 'end it all' coat of gloss varnish and a nice agrellan earth base and we're done! Easy peasy! 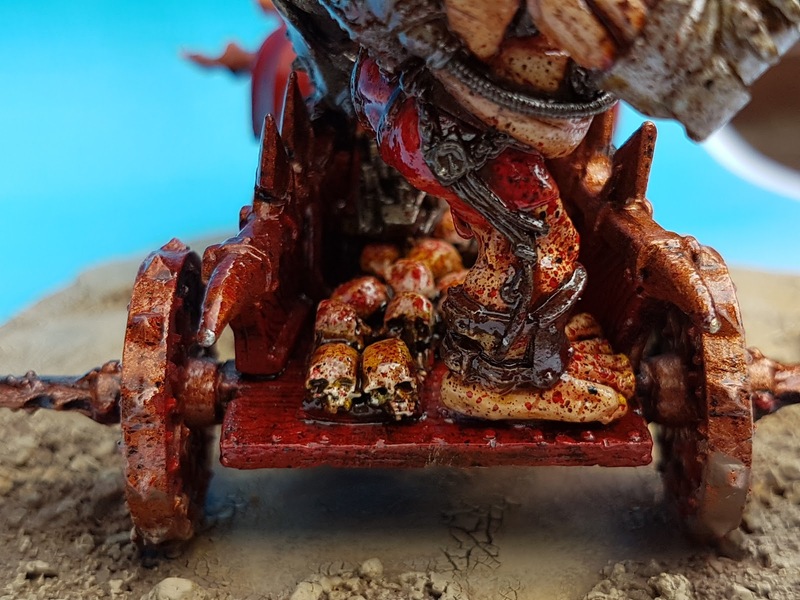 As always I present here my armylist and the units that are officially done and documented are indicated in blood red letters to please the Raging God. I love him! He looks bloody fantastic! 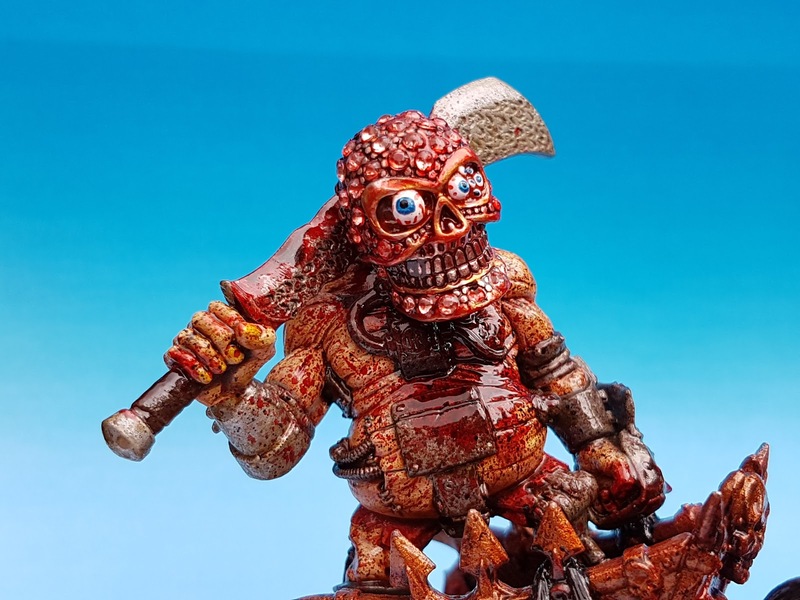 Could I ask what the base mini is?